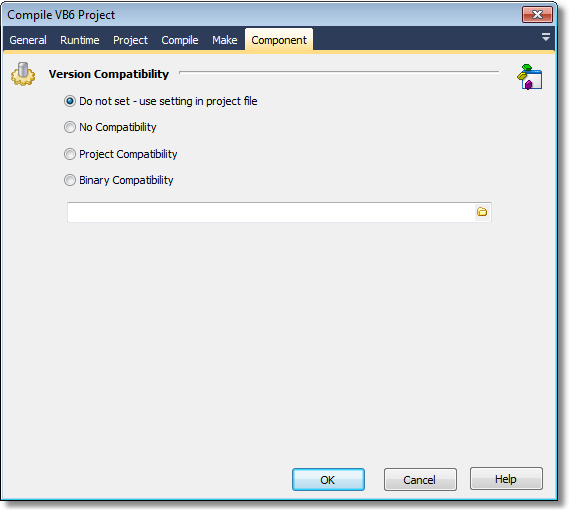 This page allows you to decide which version compatibility mode you want to use when compiling. With this setting, new class ID's, new interface ID's and a new type library ID will be generated by VB each time the ActiveX component project is compiled. This will cause any compiled client components to fail (with error 429!) and report a missing reference to the 'VB ActiveX Test Component' when a client project is loaded in the VB IDE. TIP: Use this setting to compile the initial release of a component to other developers. With this setting, VB will generate new interface ID's for classes whose interfaces have changed, but will not change the class ID's or the type library ID. This will still cause any compiled client components to fail (with error 429!) but will not report a missing reference to the 'VB ActiveX Test Component' when a client project is loaded in the VB IDE. Recompilation of client components will restore them to working order again. TIP: Use this setting during the initial development and testing of a component within the IDE and before the component is released to other developers. VB makes it possible to extend an existing class or interface by adding new methods and properties etc. and yet still retain binary compatibility. It can do this, because it silently creates a new interface ID for the extended interface and adds registration code to register the original interface ID but with a new Forward key containing the value of this new interface ID. COM will then substitute calls having the old ID with the new ID and hence applications built against the old interface will continue to work (assuming the inner workings of the component remain backward compatible!). With this setting, VB will not change any of the existing class, interface or type library ID's, however in order that it can do so, VB requires the project to specify an existing compiled version that it can compare against to ensure that existing interfaces have not been broken. TIP: Use this setting following the release of a component to other developers.